Title: Lord Protector 1653-1658. (With the authority of a King). Educated: Huntingdon, Cambridge and Lincolns Inn. Married: Elizabeth Bourchier in 1620.eight children - four boys and four girls. Died: 3rd September 1658, Whitehall. Buried: Henry VII's Chapel, Westminster Abbey, London, in the small east chapel, where a Flagstone records his burial there together with members of his family. St Nicholas's Church, Chiswick Mall, London also lays claim to his body. 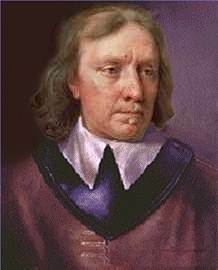 Oliver Cromwell was born on 25th April 1599 in Huntingdon. He was educated at the Grammar school there, and in 1616 spent a year at Sidney Sussex College Cambridge, before his father died in 1617. He studied at the Inns Court in London where he met and married Elizabeth Bourchier in 1620. They were a devoted couple throughout their long marriage and had eight children - four boys and four girls. Nearly 2m (6ft) tall, with grey eyes and a large nose, Oliver Cromwell was not at all handsome, although he was once described (by an enemy) as "of majestic deportment and comely presence". Contrary to public perception he was not adverse to pleasure and enjoyed hunting, riding and music. He was a devout Puritan as were all typical of his class at this time, and he entered Parliament as member for Huntingdon in 1628. He served under the Earl of' Essex, when the Civil War broke out in 1642, Cromwell was forty-three, it soon became clear that he possessed unexpected talents and abilities. A man of intense religious devotion, Cromwell believed that everything he did was guided by God's will. This made him agonizingly hesitant, but once a decision was made, "the swift, daring hammer-stroke" followed. A man of masterful energy and with considerable personal charm, Cromwell was, for his time, amazingly tolerant of religious and political dissent. Though totally lacking in previous military experience, he created and led a superb force of cavalry, the Ironsides, and rose from the rank of captain to that of lieutenant-general in three years, displaying, at the same time, a paradoxical mixture of religious sincerity and astute political opportunism. Before 1645 he was one of the parliamentarians who refused to compromise with the loyalists, and again, in 1647, he took the side of the New Model Army in the face of attempts to disband it. He was a prime mover in the trial and execution of the King in 1649, and after the Commonwealth (1649-53) was established, he became lord-general and commander in chief and lord lieutenant of Ireland, where he presided over the massacres of the garrisons of Drogheda and Wexford. In 1657 Cromwell Meets with the Second Protectorate Parliament, where he is offered the crown of England. Which he refused, and was reported to have said the following, "Did I cut off this late kings head, only to steal his crown. If this be all you think of me, then you take me wrong: This bauble: this worthless trinket" (the crown of England) "give it to some whore for the price of her bed." He died at Whitehall on 3 September 1658, and was buried with great pomp in Westminster Abbey. At the Restoration, however, his body together with those of other regicides was disinterred and beheaded posthumously and hung on Tyburn gallows until 30th January 1661, the anniversary of Charles l's execution, his head then being stuck on a pole on top of Westminster Hall. Here it stayed for twenty years until it blew down in a gale, and disappeared from history. The Times of July 1969 reported that according to letters from Captain E. L. Dale, the son of the Reverend Lawford Dale, Vicar of St Nicholas's church, Cheswick Mall in West London, in 1882, the Protector's remains had been switched at burial at the Protector's own request, and were later buried in the vaults of St Nicholas's Church. If this is true, they are now sealed under a thick cement floor. A letter to The Times, 31 August 1989, from Philllda Grantham, stated that she once held Cromwell’s head, 'then in the possession of the Wilkinson family', and that it is now buried at his old Cambridge college, Sidney Sussex.